“I think we’ll see fifty,” I say. Eight pilgrims pass before I have my backpack on. I nod at them and watch them disappear down the path toward Santiago. It’s 8 AM. They must have gotten up before Dawn. Daya thinks for a bit as two more pilgrims pass. “I’ll go with 82,” she says. We turn south on the trail, going against the stream of pilgrims, and begin to count. A couple walking side by side. A group strung out over a hundred yards or so. Two guys marching along with heavy packs. A band of school kids all wearing bright green vests. In ten minutes I know I am laughably wrong. We pass 90 by 9:16 AM. By 10:00 we’ve passed 210. By noon, 400, all flowing toward Santiago like a giant river of people and we are two salmon swimming upstream counting and saying “buen Camino” over and over again. People stare at us in confusion. They tell us we are going the wrong way. A crowd sitting at a cafe table cheers us for some unknown reason. Some ask if we are returning the way we came. 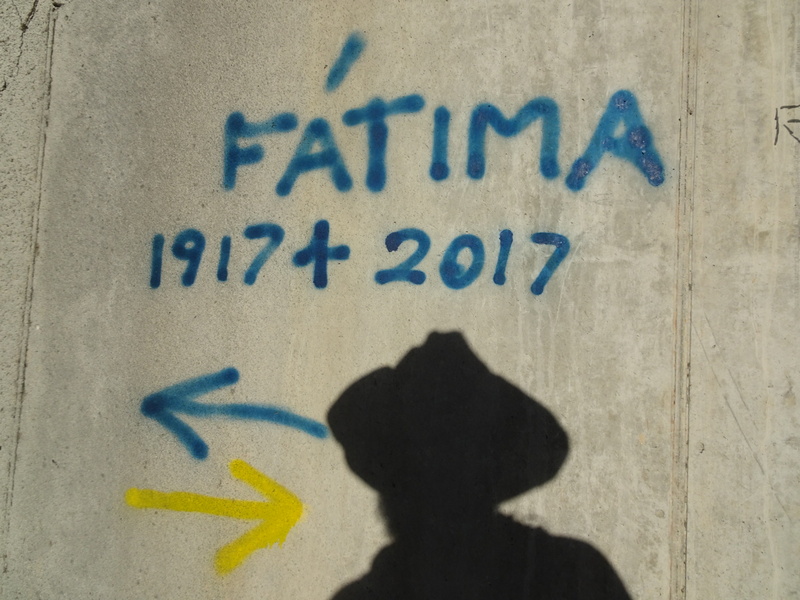 Others ask if we are going to Fatima which we adopt as a simple explanation for heading south. “Yes, Fatima,” we say over and over again even though we have the barest understanding of what Fatima is. I remember seeing a picture of it when I was in Lourdes so it must be associated with the Virgin Mary, but that is all. Children? Houses? We nod, smile, and have no idea what they are talking about, but we still say Fatima. The count reaches 531 by 1:20 PM. There are big people and small, fat and skinny, athletes and couch potatoes, old and young, men and women, tall and short, alone and in groups, different languages, cultures, and colors all moving toward Santiago. The flow begins to trickle away into the heat of the day. People look tired. By 4 PM we pass six hundred and the trail feels almost empty with only a few walking here and there. Most have tucked away in albergues or hotels. They’re nursing hurt feet and tired legs. The stream becomes a trickle. The count ends at 708. Posted in Europe North to SouthTagged Camino Portugese, ENS, Europe North to South, featured, SpainBookmark the permalink. Wow! I had no idea there would be so many walking the trail! If this is off-season, how many walk it during the season?!?!?!?! Je je je. Here in Spain *everything* has something to do with the Virgin Mary … Happy trails southward! Hope the bears don’t get you on your upstream journey. I think any other discussion of this salmon upstream metaphor is off-limits. Wow! Talk about a great way to people watch!